Anyone else starting to see the leaves hitting the ground after a blistering hot Summer? They’re starting to fall at my house, and my heart has never been so happy to watch leaves die and fall off trees. One of my favorite shades of Fall is burgundy. I just love how rich and warm the color is while simultaneously remaining dark and somewhat mysterious. So, today I thought I would share some of my favorite glossier shades of burgundy. Not everyone likes a matte lip, and I will sometimes wear glossier formulas as well, so I thought it would be a good time to take a break from the matte lipstick fever. If you’re interested, just keep reading! Nyx Butter Gloss “Devil’s Food Cake-“ I really love the butter gloss formula, and I’m sure I’ve mentioned it before. These smell incredible and feel so light and non sticky on the lips. You do have to reapply them fairly often, but it’s not a hassle when the formula is so comfortable to begin with. This shade is more sheer, but looks lovely topped over lipsticks. Milani’s Gloss in “Black Cherry-“ This shade is very dark, and could probably be worn alone or over a darker lip liner just so it doesn’t move around very much. I also like this formula, though not as much as the butter glosses. 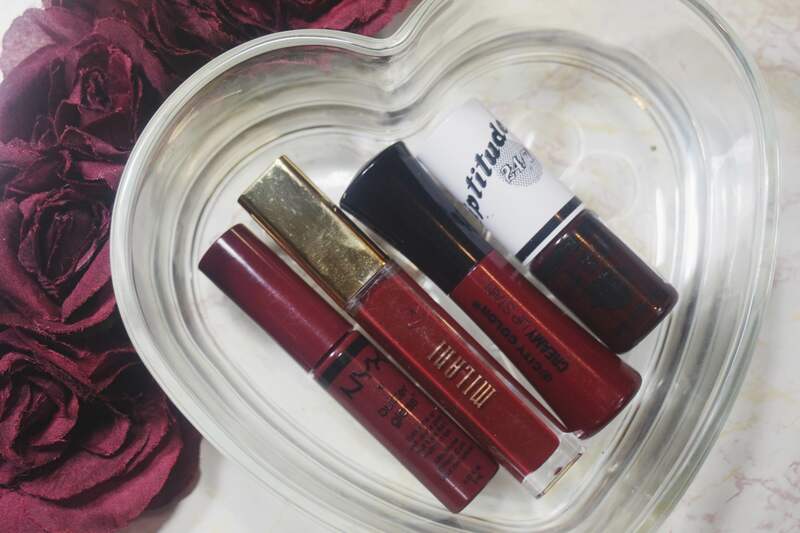 Milani always has stellar lip products, and these are a very affordable alternative to the more expensive glosses on the market. City Color Cosmetics Creamy Lip Stain “Chocolate Merlot-” This is technically not a gloss, but hear me out. This color and formula is so rich. I picked this up at Five Below last year on a whim, and I did not expect to love the color and formula as much as I do. These are more of a stain, but are super comfortable and feel like a suede texture on the lips. These are also $4.99 on their site or $3 at your local Five Below. If you decide to order some of these, I do have a coupon code that will save you 10%! Just enter Lunafayebeauty 🙂 but no pressure, there are coupon codes everywhere. JCat Liptitude in “Fantasy Dreamer-” This color is one of my favorites in this entire line. 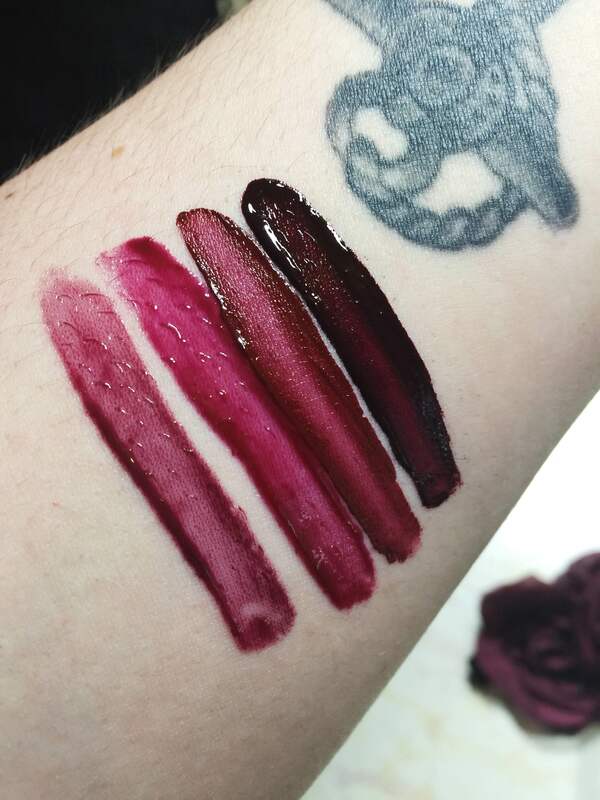 I did a review with lip swatches of these, and this color is so dark and so vampy. It’s probably more of a blackened purple than burgundy, but oh well…it’s still worthy. These are semi-matte and pair fantasically with other lipsticks and liners. That and the applicator on these are thin and longer, which makes applying them way easier. I have a video review here that you can watch if you want. That’s it for the few darker glosses I wanted to share today! I honestly don’t own too many glosses or glossy products, so I just wanted to share the few that I do have! What are some of your favorite glosses or lipsticks for fall? That was my justifying thought as well lol. Like a “close enough” kind of thing haha.